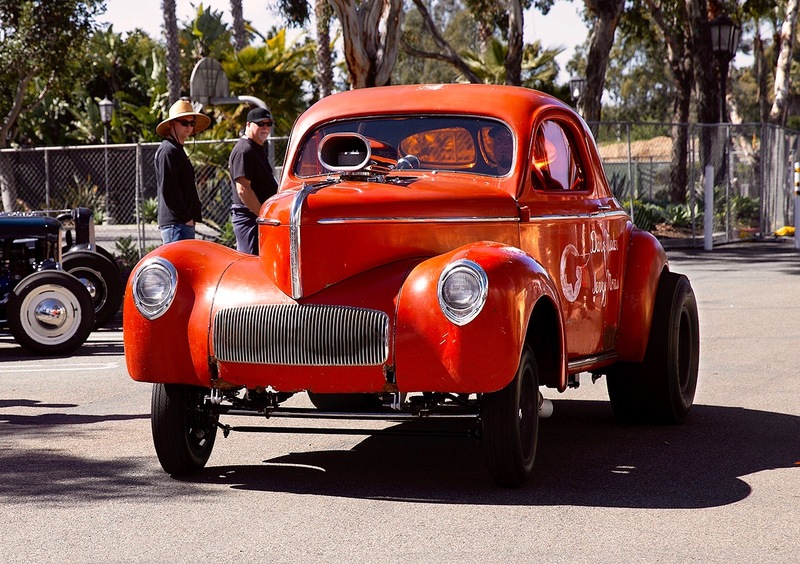 Revisiting the way it was in 1949 when modified Ford Flatheads and Fours ruled the roost at the Goleta Drags – only updated to include later-model cars and OHV V8s. 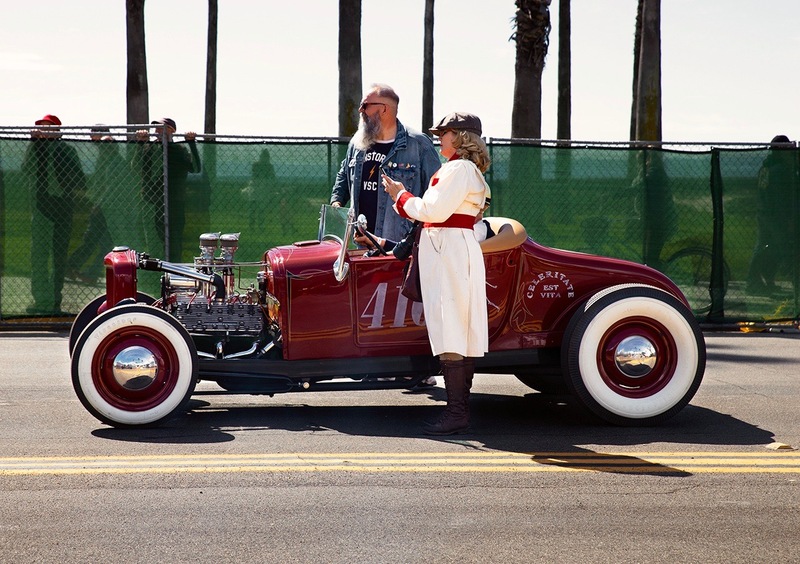 Our intrepid reporter and consummate carguy, Jim Palam, brings us coverage of TROG (WEST). 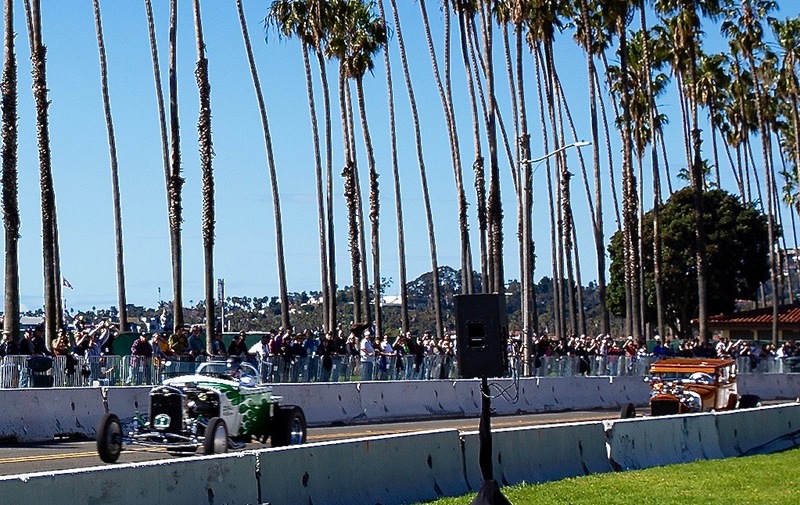 It took some doing, but after 70 years drag racing returned to its American birthplace – Santa Barbara, CA. It was back in 1949 that the first planned and permitted drag race took place on an access road at what is now Santa Barbara Airport. 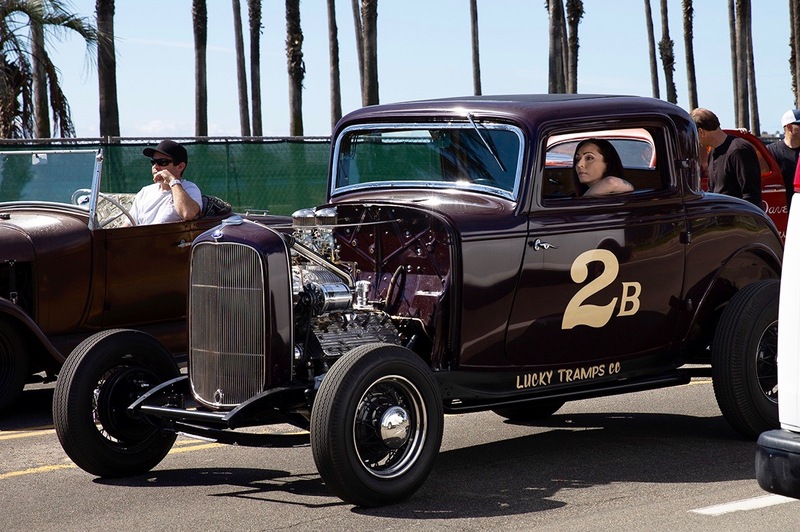 That historic event centered on a grudge match between Fran Hernandez, who was an engine man for Vic Edelbrock, and hot rod innovator and street racer Tom Cobbs. Too much power and a gamble on gearing left Tom spinning the wheels and Fran getting a hole shot to win the race. And so it began. Fast-forward to 2019 and 1/8th of a sun-kissed mile on beachside Cabrillo Boulevard in Santa Barbara. 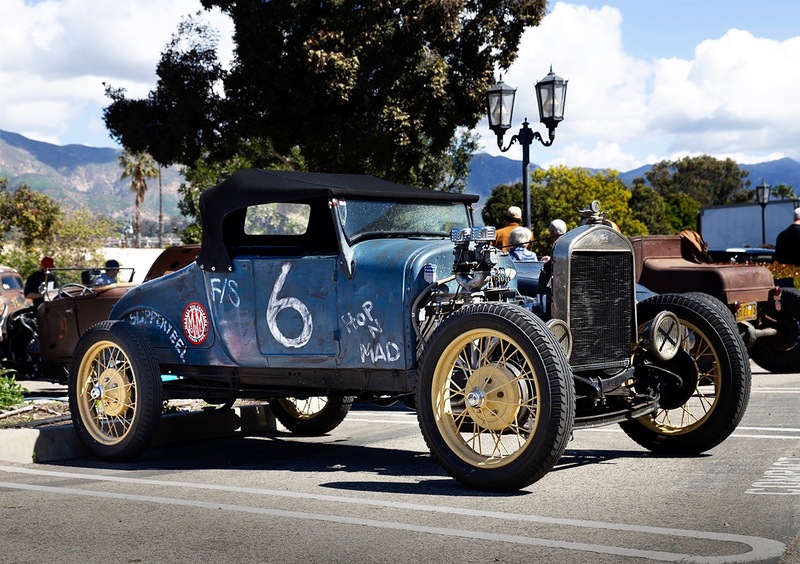 Somehow Car Guys from Santa Barbara and Jersey sand-scorchers from The Race of Gentlemen (TROG) got together and convinced the City to approve a TROG spinoff, Santa Barbara Drags – but with a caveat – no racing on the beach. 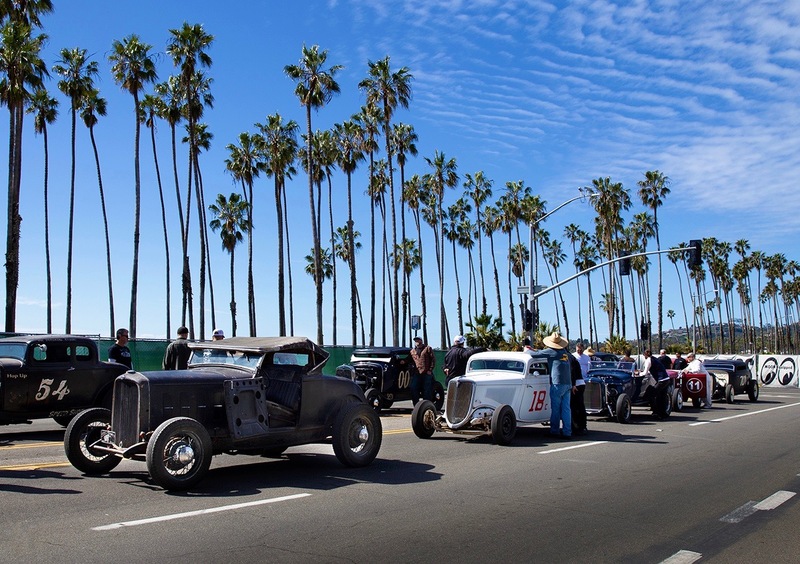 So a little after 9AM on Saturday, March 9th, the first patches of TROG-SB burnt rubber were laid down on palm-lined Cabrillo Boulevard, right in front of the Hilton Hotel which served as the epicenter for this rumbling race of speedy gentlemen. Breaking from TROG’s sand-racing tradition that all vehicles have to be American-made Pre-1934 modifieds, powered by Pre-1953 American-made, gas-burning 4 cylinder or V8 Flathead motors – 1950s and 1960s racers with OHV engines and slicks would be allowed in this inaugural Santa Barbara race. Participants followed safety rules and raced for fun and bragging rights, no trophies. The Latin words “Celeritate Est Vita” painted on the side of this vintage roadster translate roughly to The Speed of Life or Speed Is Life. I’m not sure how you clock that! BTW, I’ve always found it interesting that a considerable volume of vintage mechanics clothing and riding coats were made from unbleached, un-printed fabrics. The pits were conveniently located in one of the back parking areas for the Hilton Hotel. 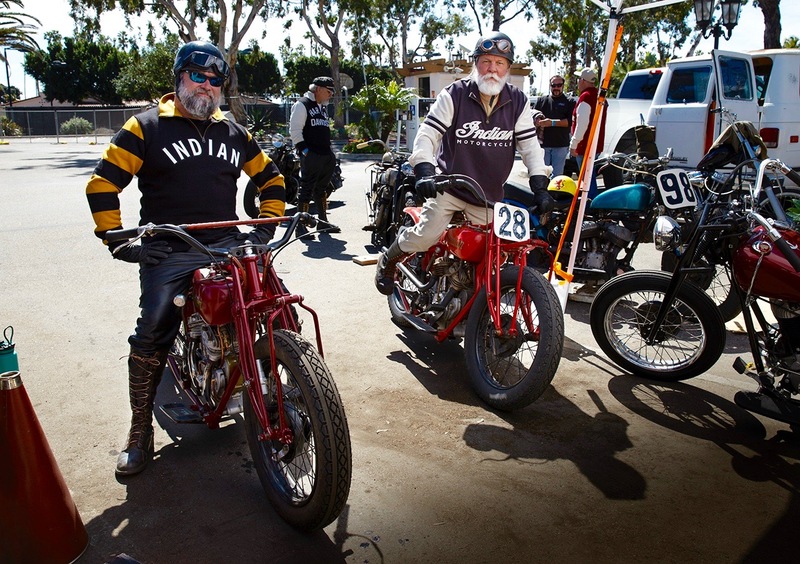 That’s where I grabbed this shot of two dapper gents kick-starting their vintage Indians. Many of the participants dressed in period-correct racing outfits. Vintage American-made Big Twins – including 45 Flatheads and Panheads – were welcome. Belying the overriding “Gentlemen” zeitgeist of the event there were many ladies in the pits and ripping up the boulevard as well. I captured Brooke Dolan, who owns the Two Bit Barbershop in Fort Collins, CO, lined-up in the staging area, looking relaxed but not ready to cut the competition any slack. One of the crowd favorites was the ’41 Mader & Morris Willys. The Hot Rod Garage brothers out of Lompoc, CA now own this famous Gasser. Its blown 392 Hemi with Hedman headers provided a quickly recognizable audio signature that had heads turning and toes rising! This low, flamed late-1950s custom Buick quickly caught my eye when I first entered the pit area. Not so much because of its stance and the beautifully executed flames, but more because it was being used as a tow car! 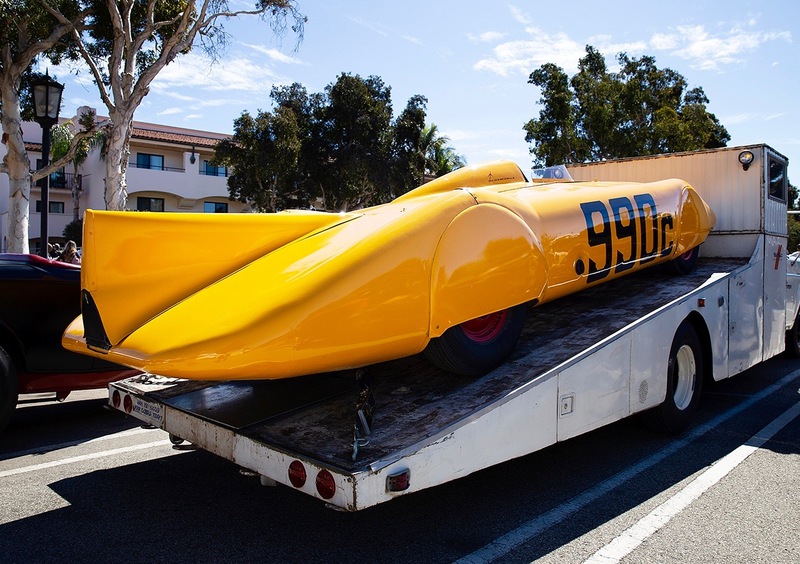 I didn’t see the famous 990c Golden Rod Streamliner actually race on Saturday but it looked like a rocket latched to its vintage Mickey Thompson hauler/launch pad. It was a familiar if not blurry site at Bonneville in the 1950s. Every time I saw young Alex Carlos in the pits or lined-up to race he was out of his shiny Penny-Hemi, wielding a polishing cloth. He has reason to be proud: His meticulously modified No. 15 “T” is powered by a crackling 354-cube Hemi that’s fed via a classic Weiand intake. Chromed Chrysler valve covers are also frequent beneficiaries of Alex’s polishing skills. The Race of Gentlemen is about smile-inducing authenticity and tradition. Take Ol’ No.6 Hop n Mad here. She’s old. She’s modified. And she’s racing under the sea birds by the Pacific. It would have been right at home at the inaugural Goleta Drags! 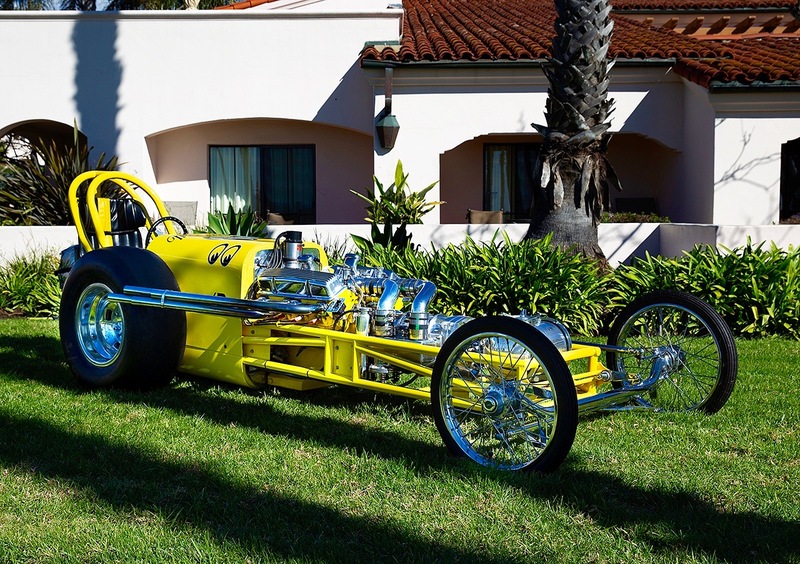 Mooneyes Speed Equipment brought a display booth and their famous Mooneyes dragster up to Santa Barbara from their home base in Santa Fe Springs, CA. This ‘recreation’ honors the original that was built in 1961. With its bright yellow paint and Vertex-sparked Chevy SB motor with a front-mounted Potvin blower, it’s a quickly recognized, crowd pleasing promotional tool and historic drag racing icon. 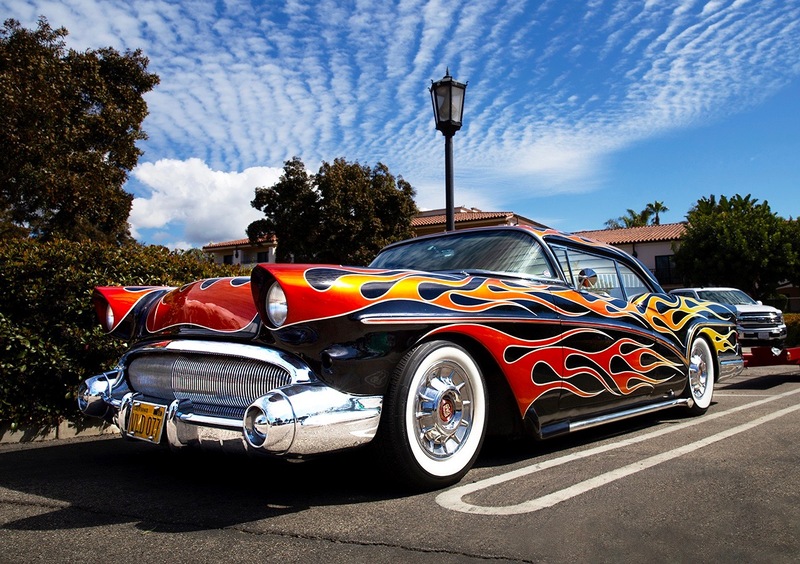 It wasn’t surprising that many of the attendees at TROG-SB drove to Santa Barbara in vehicles as special as the event itself. 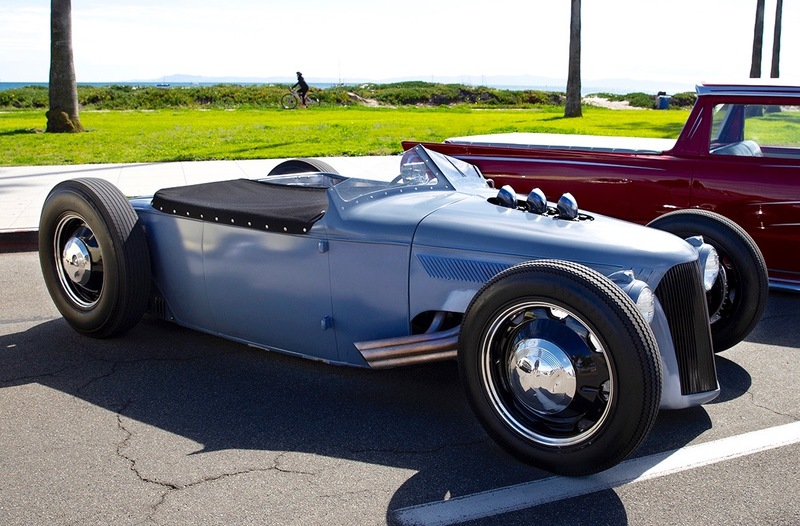 This channeled, blue-gray roadster had so many beautiful modifications that it would be hard to pick a favorite. But I do love the split windshield behind exposed and minimalist intake and exhaust components. 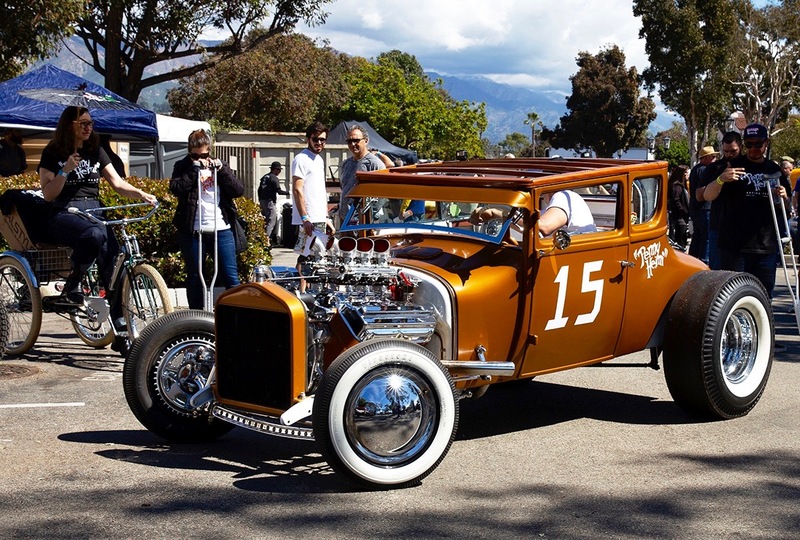 Just outside the hotel and within the rotunda area, TROG-SB featured a Show-Within-a -Race – the bonus Customs by the Sea car show. 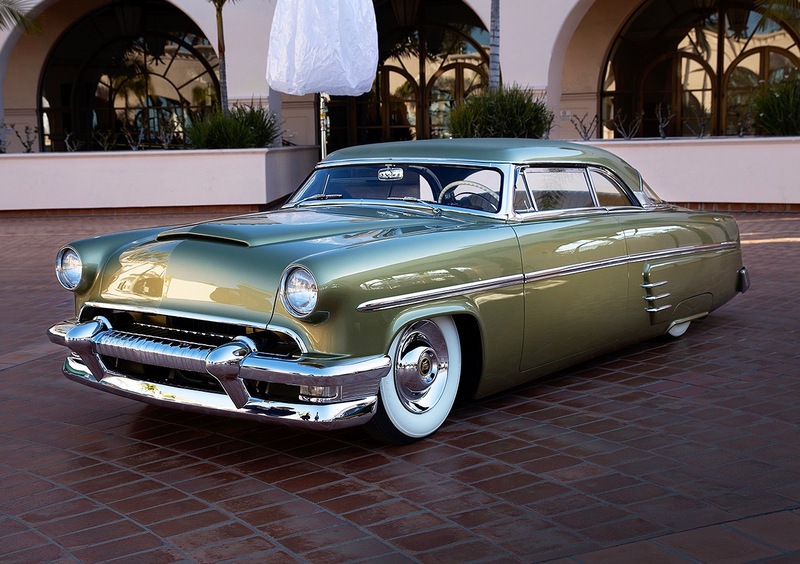 Scott Robert owns this slick chopped, nosed and shaved ’54 Mercury Monterey. This heavenly creation is named El Sueno, The Dream. Don’t wake me up! 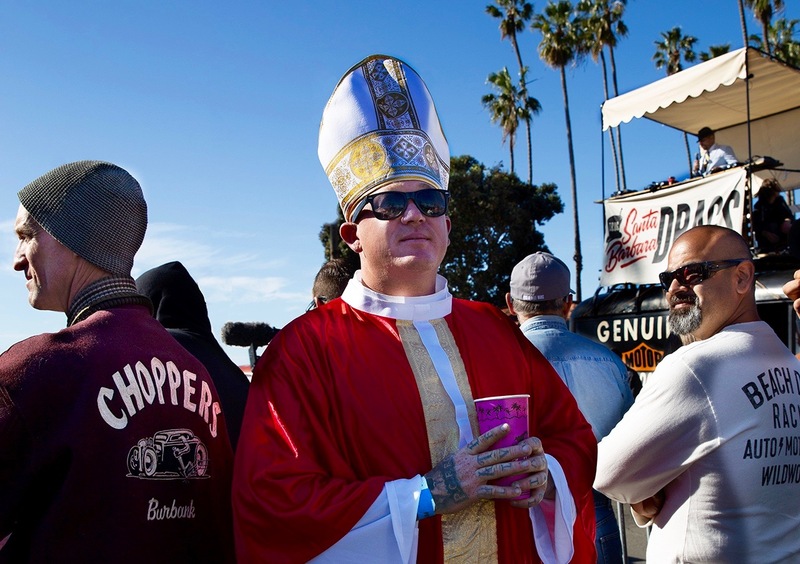 You don’t have to be religious to think that a divine hand may have helped in creating this beautiful day of racing by the beach. As I was contemplating that notion I noticed an imposing gentleman by the track’s starting line. He was wearing robes and a towering mitre – the kind a Bishop or a Pope might wear. Coincidence? Wow awesome article!! Love the Pics especially Van shot..how do I get copy of newspaper article? Really Nice article on TRoG Santa Barbara Martyn. Just to clarify the Latin words “Celeritate Est Vita” means “Speed is Life” it’s the motto of our club, The Barnstormers. Apologies to The Barnstormers for the incorrect translation of their Latin words motto “Celeritate Est Vita”. Probably why my altar boy years were short-lived. ~Jim P.
Hi Jenny McCormack. There is no printed edition of Car Guy Chronicles, but I trust you received the two photos I emailed to you of you leaping and Mac posing. Great meeting you guys at SB Drags!